HHPR is an all-volunteer, licensed 501c3 nonprofit and licensed by the State of Maine, ID number 94-3471733. On our Facebook page we will be looking back at some highlights of our 10 years of volunteer service to our community. In 2011, Echoes Magazine published an article about HHPR. We’ve scanned it into PDF and you can read HHPR Echoes. We started 2017 with 64 cats. We took in another 221: 58 Owner surrender, 75 Stray, 14 Born at HHPR, 39 Ferals, 35 Low Income assistance requests. Cats who left HHPR: 214. 71 Adopted locally, 73 Transferred, 6 Barn cats, 8 Returned to Owner, 7 Infant death, 11 Euthanized, 1 DOA, 11 Low Income Assistance given. Cats coming into our care: 98 from owners, 8 were born at HHPR, 84 strays were taken in, 52 ferals were brought in from our TNR program, we helped 17 low incomes situations for a total of 259 intakes for 2016. 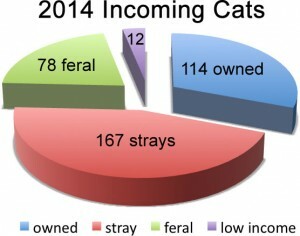 Leaving HHPR in 2016 were 251: 47 were adopted locally, 126 were transferred to networking no-kill shelters in Maine, 17 were located to barns, 2 kittens died, 12 cats required euthanasia due to extreme medical condition, we assisted 24 cats from low income situations, and returned 23 cats to owners. In 2016 we saw continued need in the area and a drop in suitable adoption applications. Our transport program saw increased activity, allowing us to continue meeting the needs of emergency and special needs cases. The year 2014 showed continued expansion of community need. 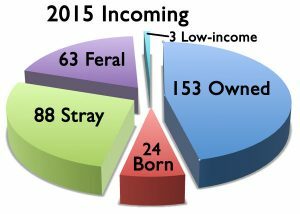 In 2014 HHPR took in 371 cats: 114 were owner surrender, 167 were stray, 78 feral, 12 were from low income situations needed help. HHPR facilitated 80 adoptions in the local area and 153 were transferred to other shelters where they were adopted. 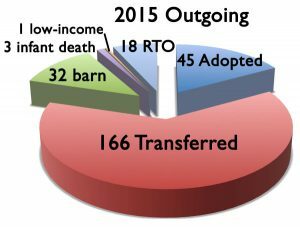 The other outgoing numbers are: 30 went to barns, 22 were returned to their owners, 6 low income cases received help from HHPR, we had 6 infant deaths and 4 cats required humane euthanasia due to extreme illness. The year 2014 has been our busiest year yet. The numbers for that year will be available soon. 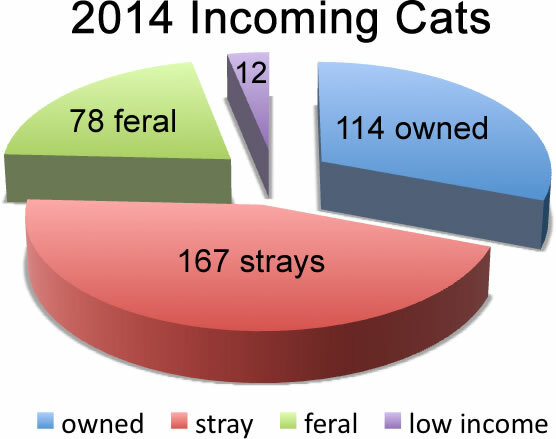 In 2013, 267 cats came through HHPR adding to the 31 already here. 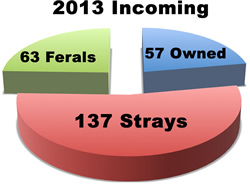 137 were brought in as strays, 57 were owner surrendered, 63 ferals were humanely captured. 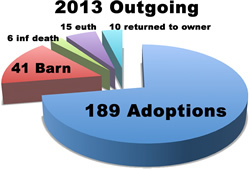 HHPR facilitated 189 adoptions in 2013. Unfortunately, we lost 6 kittens to disease, 15 cats required euthanasia due to extreme illness, 10 cats were returned to their owners, and 41 became barn cats.